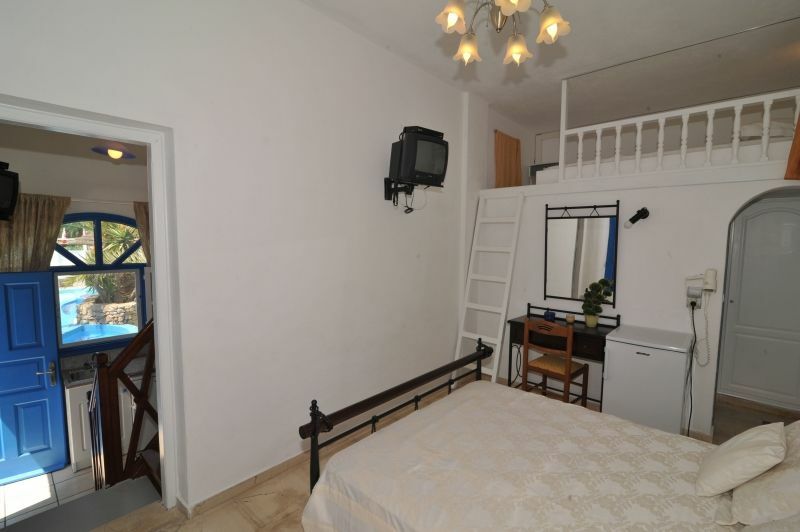 Beautifully decorated room, about 20sqr meters, accomodate with a double bed or twin beds. Maximium capacity of 2 adults there is no possibility for extra bed or baby cot. For your comfort, all rooms and studios have been recently refurbished. We have installed in every room double soundproofed opening windows, a self-operated inverter air conditionning, 32 Inch Led TV with private satellite receiver, a full size refrigerator with deep freezer, a private safe deposit box, hairdryer, direct dial phone.There is a private bathroom with shower equipped with shower curtain and amenities and a private balcony. WI-FI high speed secure internet connection throughout the property free of charge. Free parking, no reservation neccessary. The hotel features a large swimming pool with sun beds, a children's pool and a Jacuzzi. A pool bar offering snacks and drinks is open until late, when closed there is a 24 hours vending machine at the pool area. The luggage storage and the private open parking can be use without previous reservation. The opening hours for all the above facilities are from 08am till 08pm. Wi-fi high speed internet connection is available throughout the entire property. Vassilis and Marilyn are always on hand to cater for any needs you might have, ask the multilingual staff at the reception for rent a car or book a trip to the famous still active volcano of Santorini . What to do: The Best is located in the heart of Perissa, with easy access to local bars and restaurants as well as the famous 24hr bakery shop of Perissa. There is a horse riding club and a water park about 300 meters from the hotel. For those sea lovers the “MEDITERANEAN “dive club Santorini is just 300 meters from the hotel and you can reserve at the reception your diving session or scuba diving excursions. Children up to 2 years old using existing beds free of charge. Baby cots (o to 2 years okd) are available on request and are free of charge. Every older child using an extra bed is charge an extra 20% of the room rate per night stay. Please check the cancelation policy as it may vary per room type. The hotel reserves the right to pre-authorise the credit card any time after booking, in case of an invalid card the reservation will be cancel without further notice. For standard room type Cancelation is 30 days prior arrival no fee, after that or in case of no-show the total amount of the reservation will be charge as a cancelation fee. The hotel reserve the rights to pre-check credit cards information, in case of an invalid card the reservation will be cancel without further notice. 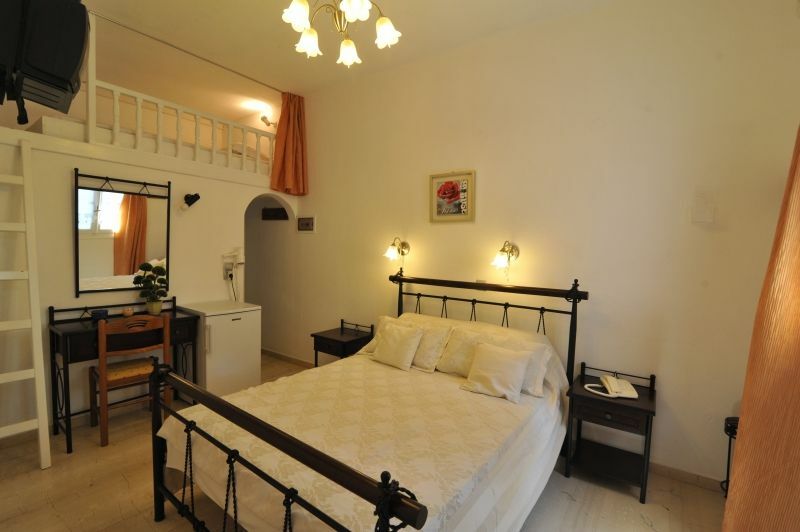 For your comfort, all rooms and studios have been recently renovated. With an average size of 38m2, the apartment comes with warm and bright Cycladic island colours, two beautifully adjoining rooms each with a private entrance.It has a view on the pool or the garden. With a maximum capacity of six adults, it is a very good choice for family. Room facilities: sound-proof opening windows with mosquito nets, marble/tile floors, self-operated inverter air conditioning, working desk, full size refrigerator with deep freezer, 32 inch flat screen LED TV with digital channels, private Satellite receiver, in-room safe, hairdryer, private balcony with modern furniture, telephone, Wi-Fi high-speed Internet access (free of charge), beds have new anatomic and ecological mattresses. The apartment has two separate private bathrooms with W/C, shower with shower curtain, towels and free toiletries. 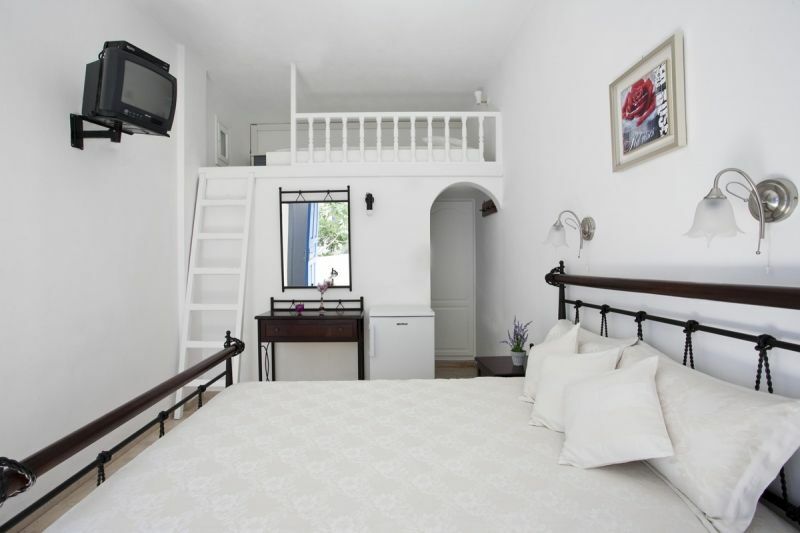 The first room has a fully equipped kitchenette and a sitting area, the double bed is on a mezzanine (1,80m high), the adjoining room features a double bed on the ground floor and a double mattress on a mezzanine (1,00m high). With an average size of 25m2, the studio comes with warm and bright Cycladic island colours, one beautiful room with a private entrance.nice balcony with modern furnitures with a great view on the pool and the mountain. With a maximum capacity of four adults, it is a very good choice for family. 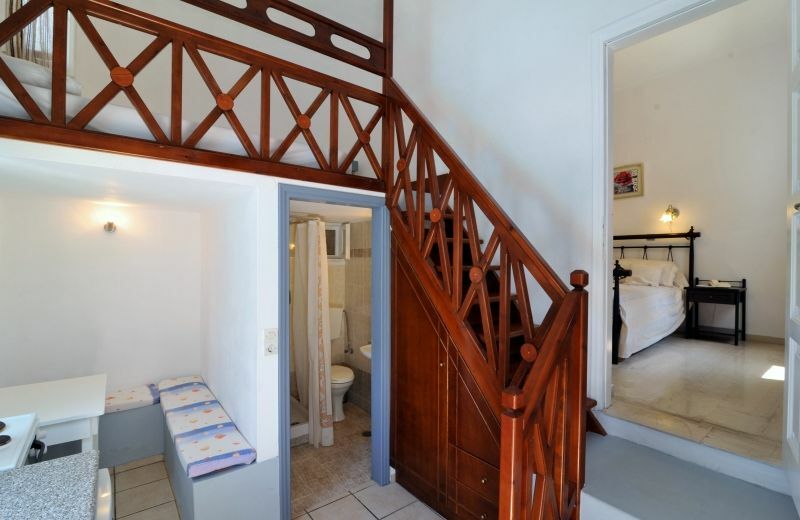 The studio has a private bathrooms with W/C, shower with shower curtain, towels and free toiletries. It features as well a fully equipped kitchenette and a sitting area, the room has a double bed on the ground floor and a double mattress on a mezzanine (1,00m high). There is possibility for an extra bed or crib. 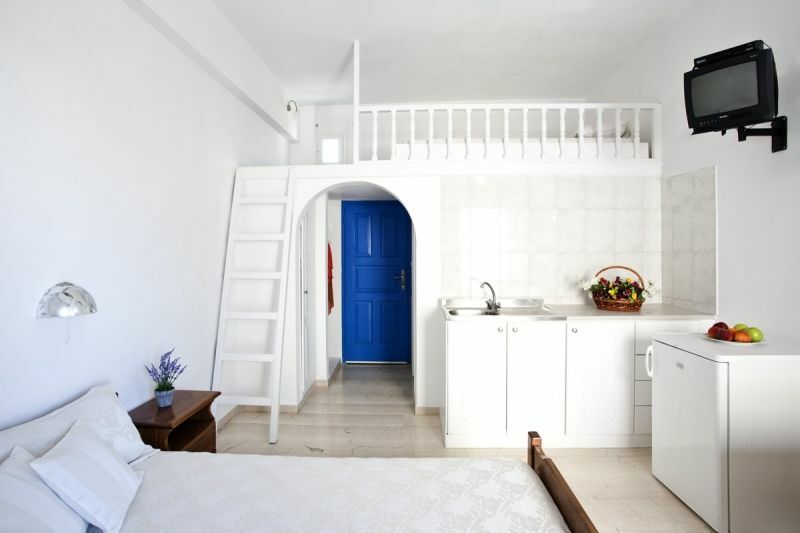 With an average size of 20m2, the studio comes with warm and bright Cycladic island colours, one cozy room with a private entrance.It has a double bed and twin bunk bed. With a maximum capacity of 2adults and two children it is a very good choice for family. Room facilities: sound-proof opening windows with mosquito nets, marble/tile floors, self-operated inverter air conditioning, full size refrigerator with deep freezer, 32 inch flat screen LED TV with digital channels, private Satellite receiver, in-room safe, hairdryer, private balcony with modern furniture, telephone, Wi-Fi high-speed Internet access (free of charge), beds have new anatomic and ecological mattresses.